Now you can download YouTube Videos in their original format i.e the format in which they were uploaded on YouTube. When you upload any video to YouTube, it is transcoded automatically and then posted in your videos. Google Takeout has been updated with an option to download YouTube Videos. Choose ‘YouTube‘ service. You can also go directly to Google Takeout for YouTube. It will take some time to analyze the data associated with your Youtube account. Little Manual Effort. Just request the takeout and when archive is complete, you can download it. Due to large amount of video data if archiving takes long time, you can request to receive an email once archiving is finished. 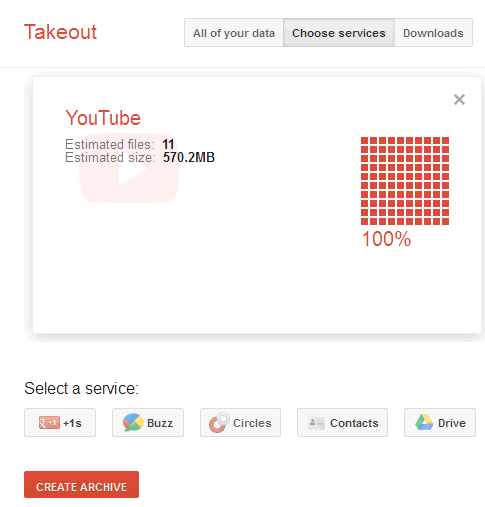 So if you ever want to download all your YouTube videos , Google Takeout can help you to do that in just few clicks. One more thing to note is that Google Takeout can’t be used to download videos which are not associated to your account.